The term �Fish� is used to describe cold-blooded, aquatic members of the phylum Chordata that have gills, fins and a stream-lined body usually covered in scales. This term includes living jawless fish, both hagfish and lampreys, living jawed cartilaginous and bony fish, extinct jawless and jawed fish. While the hagfish have many chordate features, they have a poorly developed cranium and lack a vertebral column. Hagfish are now therefore assigned to the own subphylum � the subphylum Myxine, called after the copious amount of slime (myxine) they produce when stressed. The other groups of jawless fish and the jawed fish possess a vertebral column which protects the spinal cord and serves as a structural base against which their swimming muscles can contract. These fish are assigned to three classes in the ubphylum Vertebrata. Bony Fish - Class Osteichthyes - The 23,000+ species of modern bony fish comprise about 50 species of relict or anachronistic fish representing forms that lived and mostly became extinct millions of years ago as well as the modern teleosts, the most abundant groups of vertebrates alive today. The teleosts appear to represent four evolutionary lineages: the main lineage (Euteleostei) comprises 22,000+ species; the other three lineages (1000+	species) appear to be early offshoots of the euteleost lineage. The development of strong jaws and paired fins allowed fish with vertebral columns to evolve versatile methods of feeding and locomotion. These developments helped them to undergo extensive adaptive radiation and exploit the Earth�s vast range of aquatic marine and freshwater habitats. Fossil evidence indicates that fish evolved in freshwater and later adapted to the saltwater. Some fish even venture onto land for short periods and one group, the sarcopterygians, of which a few species still remain, gave rise to the amphibians and thence the tetrapods. The jawed fish are the most numerous of vertebrate groups: there are more species than all the other species of vertebrates put together. Of the 24,000+ species of modern or extant (living) fish described so far more than half (58%) are marine species, 41 % inhabit freshwater and 1% move between the two habitats. 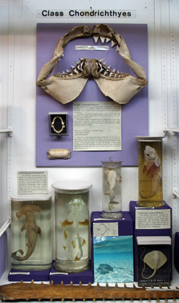 The collection includes representatives of all the major types of relict fish and specimens of small species or young specimens of large species from all the major divisions of cartilaginous and bony fish plus fossils and models of extinct jawless and jawed fish. However, the classification of the fish is controversial and exceedingly complex and many of the features used to differentiate the different groups are internal and not seen in our specimens. 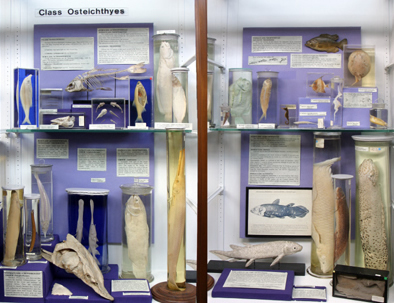 We have therefore displayed our specimens (a) to illustrate the extreme diversity of forms between and within the major taxonomic divisions and (b) to show the events which led to the amphibians and the beginnings of tetrapod evolution.